...extremist persecution reached its peak under the Muslim Brotherhood and has been contained to a degree under the authoritarian leadership of President al-Sisi, who has detained thousands of potential dissidents. According to a news release, the group stated that Abdel Fattah al-Sisi has been confirmed as President of Egypt after a low-turnout election for which there was no effective opposition. It went on to say that most of al-Sisi's opponents declined to stand in the elections, citing intimidation. It added that a former army chief was arrested after declaring his candidacy. The charity stated that Egypt has the largest remaining Christian community in the Middle East, despite continuing persecution, which Christians often call "the pressure." That "pressure," it says, stems from long-term cultural discrimination, affecting the job prospects of Christians, their access to public life and their ability to build and even repair their churches. 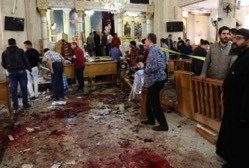 The charity said that the harshest persecution has come at the hands of Islamists, who have launched terror attacks on churches, burnt down Christian places of worship, businesses and homes and driven Christians out of Upper Egypt and Sinai. It said that extremist persecution reached its peak under the Muslim Brotherhood and has been contained to a degree under the authoritarian leadership of President al-Sisi, who has detained thousands of potential dissidents. "Security for Christians remains precarious in regions beyond Cairo, especially the villages of Upper Egypt, and increasingly Sinai, where Islamic State has a foothold," it said. "In recent years, Upper Egypt has seen an explosion in kidnapping of Christian children for ransom and as a tool of religious cleansing. And religious extremists are targeting Christian girls for kidnapping, forced marriage and conversion." Release International, which supports persecuted Christians around the world, has reported an epidemic of grooming and forced conversion in Egypt, believed to be funded by religious leaders with cash from Saudi Arabia, said the release. "This is a deliberate strategy of persecution," it quoted Release Chief Executive Paul Robinson as saying. "All too often the police turn a blind eye to kidnap attacks on Egypt's Christian minority." "While thousands of Christians have been driven out of countries such as Iraq and Syria, Egypt remains a bastion of the Christian faith in the Middle East, but that enclave is under pressure. Release International is urging President al-Sisi to protect Egypt's Christians, treat them as equal citizens and grant them full religious freedom." It went on to quote Paul Robinson as saying: "Mr President, Christians should no longer be driven from their homes, their churches must no longer be targeted for shootings, bombings and arson, and their families must be afforded the protection of the state. Please intervene to prevent this epidemic of kidnapping". It said Release International is working with partners in Egypt to help Christian communities reduce the risk of grooming and kidnapping, and to support victims. Release is helping develop spiritual resilience, tackle the lack of education and respond to the oppression and poverty that lie at the root of the problem in Egypt. Through its international network of missions UK-based Release International serves persecuted Christians by supporting pastors and Christian prisoners and their families, supplying Christian literature and Bibles, and working for justice, said the news release.